Running for elected office was never a part of my life plan, but plans change. I found myself living with multiple roommates at the age of 31, moving every 12 months due to rent hikes, working multiple jobs, and still living paycheck to paycheck. I am not the only one struggling. In fact, it seems like most of my social circle is struggling just as badly if not worse than me — hell, I’m privileged! I have two advanced degrees and I’m still broke! Those things, combined with the election of 45, cause me to wonder what more I can do. Protesting inequity is important. Writing letters to the editor is crucial. Yet there has to be some other way to help the many folks who love this city but can barely (or cannot) afford to exist here. And so here we are and here I am running for Mayor of Seattle because we urgently require change; because we have to be the change we desperately need to see; because if not us then who; because hope. Hope is one of the most powerful painful things we can carry. It is the belief beyond pain that allows what seems impossible to be possible. It is knowing that if the pain started, then the pain can stop. Hope in and of itself is a painful process one endures on faith. It is walking by faith through a challenging, and often traumatic, circumstance because you believe it will get better — it has to get better. Sometimes hope is the only reason to survive and the only way we can thrive in pain. There is a lot of pain in Seattle. There is also a lot of hope. I take people’s pain and hope very seriously. When a community or person entrusts you with their hope they are needing you to feel their pain. We tend to put our hope in those we think can do more than hear us. We place our hope in those we believe can feel us. I did not wake up one day and decide to run for Mayor of Seattle. In fact, when asked by community, I avoided it. Not because of a lack of capability, but rather out of an abundance of caution. I can be Mayor of Seattle. But the better question is this: can I be Mayor of Seattle and still be Nikkita Oliver — a queer black mixed womxn; a renter; an organizer and activist; an abolitionist; an attorney and educator? Can I be Mayor of Seattle and still be me? Yes, I can. Right now, with this campaign, in this moment, with the support of community, we are proving that you can run for mayor of a major metropolitan area and still be a principled grassroots organizer who centers the needs of the most vulnerable in policy, discourse and substantive issues and do so unapologetically and authentically. Yes, I can; not because of who I am, but because of who we are. Collectively — as a community. Sometimes we lament the loss of community within Seattle; there is some truth to this, but some of it is also nostalgia. Community still exists here in Seattle. The energy around our grassroots campaign is community. We are building a movement to transform the nature of politics in this city. As Danny Westneat of the Seattle Times points out, I am not a consistent voter for a number of reasons — some systemic and institutional barriers and some the byproduct of displacement and even disappointment. And while the reasons do matter, I will refrain from recounting them fully in this moment. What I want to focus on is the times I did vote. I was first eligible to vote in 2004. It was a Presidential election and I was excited to exercise my right. At the time I was attending Seattle Pacific University and still a resident of Indiana. So I cast an absentee ballot. I remember feeling so proud of myself because I figured out the process all by myself! I do not come from a civically engaged family. We did not talk about politics or voting growing up. I honestly do not remember watching a single Presidential debate until college. A few weeks after the election I received a letter informing me that, for whatever reason, my absentee ballot had not been accepted. I felt discouraged. Voting absentee had not been an easy process to navigate. Despite researching the process and following every direction carefully my vote was discounted! I vowed to myself next time my vote would count! Fast forward to 2008. Obama is the face of a movement for hope. He is the embodiment of a dream deferred. After casting my second ballot in a presidential election, I sit in a crowded room with my elders gazing at the television as if they are watching it for the first time. When the votes are counted and victory declared, the streets in Rainier Beach, on the south side of Seattle, fill with dancing people of all nationalities, creeds and colors crying and hugging. That night we celebrated the election of our first black president. The next morning mainstream publications beg the question, “Is the United States entering the post-racial era?” The next 8 years of the Obama administration answers with a resounding, “No.” I voted for Obama twice. I put my hope in Obama twice — maybe naively. I wanted to believe he could feel what I feel here in Seattle, WA. It is 2017. I have learned a hard but valuable lesson: One person cannot be the change we need to see. We, the community, must be the change we need to see. It is not enough to galvanize and mobilize to get a single person elected; even if it is historic; even if he is the first black President of the United States. Getting Obama into office was not the end goal. It was only the beginning and unfortunately it was a disappointing end. While I believe Obama had good intentions, the highest executive office in this country is isolating. Not to mention, Republicans and Democrats seem more hell bent on blocking each other than serving the people who they purport to represent. We put our hope in a single man and expected him to do an impossible task alone. As a result, the Obama Administration perpetuated the status quo in black face. Truth to be told, so long as the dominant political establishment stays in place, a black Head of State will struggle to be anything more than a figurehead. I am a grassroots organizer and activist. Civic participation is not one size fits all. There are many different kinds of “getting involved” and we need every single one of them. There are plenty of people who vote one-hundred percent of the time, but never attend a single city council meeting, never participate in public comment, never call their representatives, never attend school board meetings, never help draft ordinances, and never attend a protest or community meeting. I do all of these things because they actually yield results. Voting is supposed to be about using your voice to select your own representation. But what do I do when it does not matter if I choose “A, B, or C” and I still get “X”? The answer is: We organize. We mobilize. We galvanize underrepresented communities uniting our voices to speak truth to power. There is strength in numbers. The answer is: We run for office. So, why run for Mayor of Seattle? Why develop the Seattle Peoples Party? Why try to gain entrance into a system that I/we have good reason to distrust? Because hope. 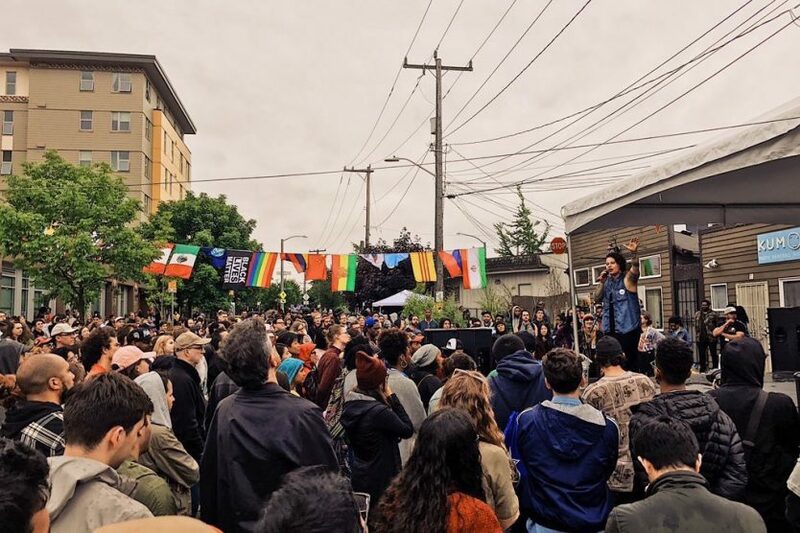 Because if our activism and organizing is not soon met with real political power, we — renters, workers, artists, people of color, low-income families, and those living unsheltered — will not be here, in Seattle, in the next four years. Because if not us then who can be the change we — the most vulnerable in this city — most need to see? I am confident I can do the big job of being Mayor of Seattle. I can do it by building the right team, creating space for the brilliance of community to develop the best most innovative solutions, and organize thousands of people to work together and achieve common goals. In fact, the thousands of volunteers who are the backbone of our campaign might say that I’m already doing this. I show it in my lived experiences and in my entire body of work. But most importantly I know, I cannot do it alone. I do not want to do it alone. I want to do it working within community collaborating and cooperating to make Seattle better. Likewise, I cannot get elected alone. I cannot end the affordability crisis or the state of emergency around homelessness alone. I cannot fully fund schools and transform the Seattle Police Department alone. We have to do it together. Getting elected is only the beginning of our hope process. Hope is one of the most painful things we can carry. It keeps us alive and it breaks our hearts. It is the belief beyond pain that what seems impossible is possible. The pain is so real, but so is the hope. More powerful than our individual hope, is the single thread of hope which binds us together believing that it has got to get better; believing that the pain once started, so it can and will also stop. No figurehead can fix this for us. Only we can. I put my hope in the People and the People are organizing with hope.